“On wings of song” would be a suitable title for this selection, because three of the great story-tellers and visionaries of the early 19th century are here brought together in a satisfying compilation. Schubert, the instrumental singer who enjoyed a certain amount of success in his lifetime with his Impromptus and “Musical Moments”; Mendelssohn, whose Songs Without Words were favourites to be “sung” on the piano, mostly in private drawing-rooms; and Chopin, who, almost exclusively on the piano, told about what was driving him mentally and even politically. 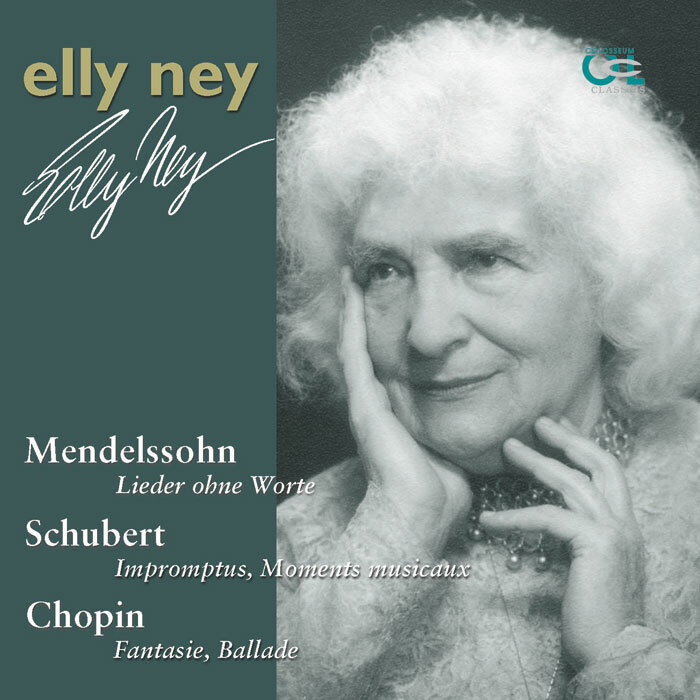 In these recordings, made between 1961 and 1967, Elly Ney takes the opportunity to penetrate the deeper regions of musical language, where forms emerged from the fleeting moment, connections from the emotions, and syntax emerged without formal grammar. In them she treads the path of early Romanticism ranging from virtuoso outbursts to mellifluous cantilena, and from dramatic tension to sunlit dreaminess.